As energy prices in Ohio and across the nation rise, Ohio farmers are considering ways to savemoney through energy efficiency and renewable energy practices. Higher energy-related input costs will generally raise the overall production cost of agricultural products, therefore reducing farm income. By better understanding farm energy consumption and implementing best practices to manage energy on the farm, Ohio farmers can have a positive impact on the environment and make their operations more profitable. 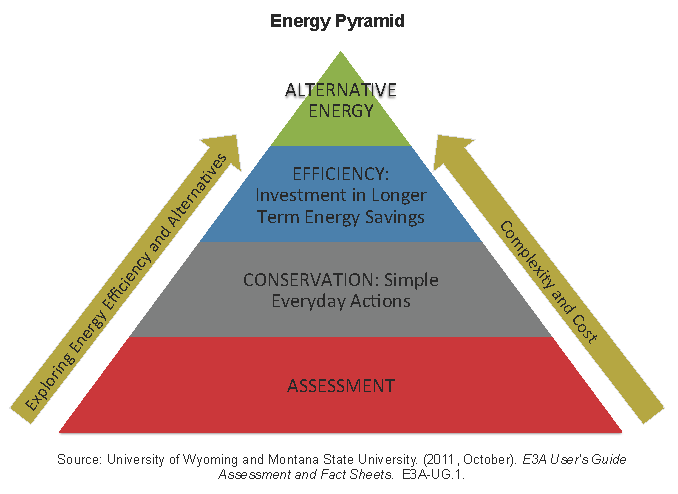 As demonstrated in the energy pyramid illustration, you should first conduct an energy audit on your farm operation, implement simple conservation practices, then consider investing in energy efficiency and renewable energy generation. The image shows that cost and complexity of energy actions typically increase as you move from energy conservation activities, to energy efficiency measures, and finally to alternative energy projects. While energy efficiency measures are typically the fastest and cheapest way to reduce farm energy cost, many farmers are also considering on-farm renewable energy generation systems to produce energy to power their farm operations. Please click on the below links to learn more about farm energy efficiency and on-farm solar energy generation in Ohio.